Are you embarrassed of your smile, do you hide your mouth in photos. Lets us help you smile wide with pride. Dental implantation is a cosmetic surgery, which consists of placing an artificial titanium root in toothless areas of the mouth. The implant will then serve as a root for the tooth crown and will stabilize the removable prothesis. The purpose behind the intervention is to permanently replace tooth loss and restore oral structures (bone, gum and periodontium). We promise you aesthetically impeccable results. Dental implants often represent the ideal solution for permanently natural stunning teeth. A dental implant is a root-form implant made of titanium; a very resistant biocompatible material. 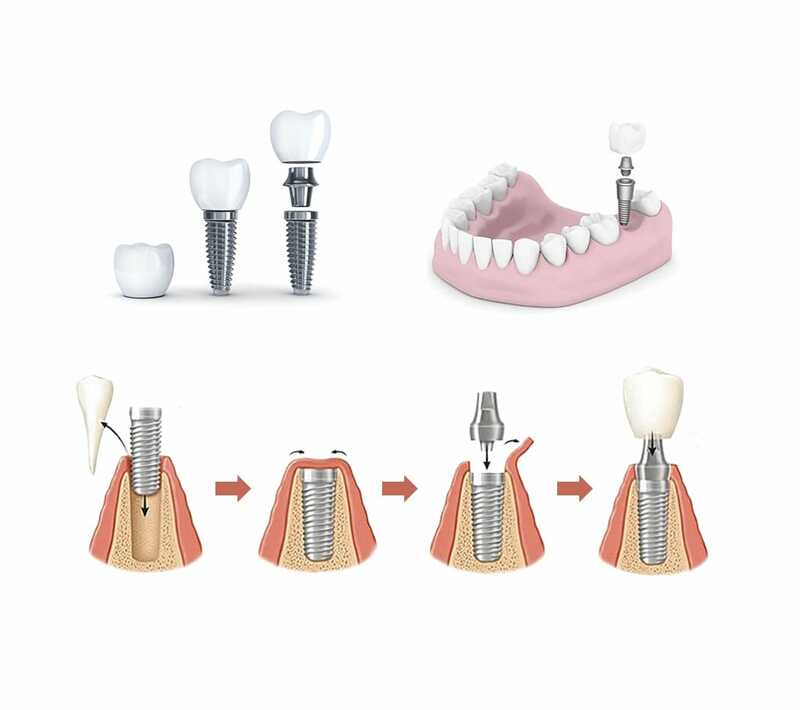 The dental implant serves as root for the dental prothesis. The implant will be placed in the jawbone, and bond to it by means of osteo-integration. This process normally takes 3 to 4 months to complete. Dental implants come in different sizes, of which the selection varies from one patient to another. Our dentist will customize the procedure for each client to maximize results. We will consider other alternatives to dental implantation like dental bridge or dental stellite. It is only after carrying out the necessary examinations that the surgeon will be able to direct the patient to the most appropriate option. The dentist evaluates bone quality in the toothless area and surrounding structures (by means of pre-surgical bone beam imaging). The evaluation helps the dentist assess the need for bone grafting, decide the procedure to follow and the number of dental implants. The dentist should also check probabilities of anatomic barriers, dental infection or root fracture. Prior to dental implantation, dental scaling and dental planning are required. Dental implantation is carried out under local anaesthesia. We can opt for sedation, but general anaesthesia is rarely needed for this surgery. The surgery lasts from thirty minutes to an hour and a half. The duration varies depending on the number of sites to implant. The surgeon starts by incising the area of implantation. Then, the implant will be directly placed and screwed into the bone. Finally, gum lines will be stitched closed. The implantation lasts for 3 to 6 months from the moment the permanent prothesis was placed. This step is known as osteo-integration. After the surgery, the patient may experience some discomfort. However, any pain is manageable through antalgics prescribed by the dentist. It is recommended after the surgery that the patient uses an icepack on swelling, avoids physical exertion and heat to minimize inflations and speed up recovery. The patient should also plan ahead 3 days of rest after the surgery. Stitches are dissolvable, however if their removal is needed, this can only take place 7 to 10 days after the surgery. 3 to 6 months after the surgery, the dentist will inspect the implant site and place the permanent prothesis. It is important that the patient takes care of their oral hygiene. The patient should also do regular check-ups to ensure that their dentition is perfectly healthy. Results are immediately visible after the placement of the final prothesis. The new denture is functionally and aesthetically perfect, teeth are healthy and harmoniously shaped. It will thus be possible for the patient to show their impeccable smile, which will turn to be a real asset for their social and professional life. The results are permanent provided good oral hygiene is practices are followed. Should you have requests for an estimate or demand further information concerning the surgery, the price or the medical stay. You can always contact us by phone or fill in a contact form on our website. Our staff is at your service and will always be glad to help you.